No matter why you raise alpacas, whether it be as pets...or champion breeding stock.... there is one thing that is certain. 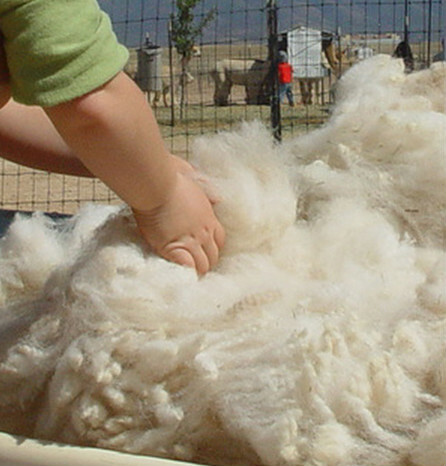 Every year around April or May, you're going to shear your alpacas fleece. That is the alpaca farmer's annual 'harvest'. Honestly...I just wasn't into fiber for a long time. At Peaceful Prairie Ranch, we raised alpacas as a breeding stock business. Shearing was fun, but I practically gave the fleece or fiber away! In the very beginning I would look at shorn alpaca fiber and kinda think 'ugh.....what am I gonna do with all this fluff?'. Well, I have certainly evolved in my last 12 years with alpacas. Whether its 'getting older' (which translates to 'wiser') or wanting to be a little 'greener' and live in a simple and sustainable manner ~ we are now really into fiber! I'm not a certified fiber fanatic, but I have a lot of fun with the stuff. Most importantly, North American alpaca breeders breed for 'genetic gain'. We certainly do have that goal here at PPR. That means that we do selective breeding to promote positive genetic traits in the alpaca such as finer fleeces and greater density in fleeces. So....while I celebrated a 6.5 pound shearing of Monet the alpaca, back in 2001, we now get excited about 9 and 10 pound shearing weights in some of our stock. Why? It's the fiber farmers 'harvest', and every pound of fleece can become approximately 4 nice pairs of socks (or skeins of yarn, etc...). If we're going to feed & care for the alpaca all year, we certainly want our alpacas to shear as much luxurious fleece as possible. So, our goals are accomplished in this continuous evolution of our breeding program. The history of the alpaca is just amazing....they were grazing and minding their own business back in the 1500s, living a nice pastoral lifestyle with the Incans in South America. The Incans were quite accomplished using alpaca in textiles. 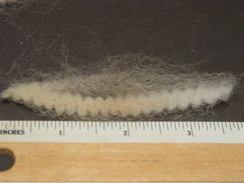 Very fine fleeces have been recovered in archaeology from this time period. However, in time, the Spanish Conquistadors rode through town and decided to slaughter the alpaca to show the Incans who was the boss. They placed no value on the alpaca initially and preferred their own Merino sheep. It is written that this is what drove alpacas from a lower elevation up to the high altiplanos. Why bother the alpacas, we wonder...how could they?? Well, they did. And especially colored alpacas. These Conquistador dudes only liked the white alpacas so they could dye the fiber whatever color the big King wanted (probably red). The alpaca became nearly extinct. Turns out...the natural fiber, or fleece, of the alpaca is really something! It wicks & repels moisture, and it insulates the wearer due to its hollow-core technology. It is light, yet drapey. It is the warmest stuff, and the softest. It rivals cashmere, and is sometimes softer. There is some variation in alpaca micron (fineness) hence the variables that can be found in 'softness'. Again, we are breeding for genetic gain, and softness is another trait we strive to improve, and certainly do improve on with each generation of alpaca. Alpaca fleece isn't just 'fur' that we use because we have nothing better to use...its the best natural fiber around! Alpaca fiber is hypoallergenic, unlike sheep with grease/lanolin in the wool. And softer than other natural fibers. 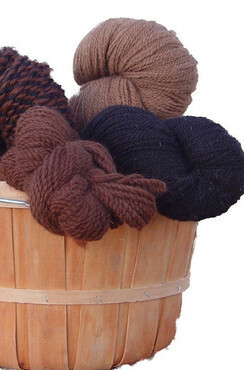 Alpaca also comes in the most natural-colors as any fiber animal. There are 22 natural colors of alpaca!